Dealing with weeds may be one of the worst parts of gardening. No matter how diligent you are or how much you cover crop and mulch there will always be a few that get by you and mature. While I’ve often heard gardeners refer to edible weeds with the positive motto, “if you can’t beat them eat them.” It doesn’t always work for me. When I’ve worked hard to nurture a late crop of heirloom lettuce onto our plates, a salad of wild greens just doesn’t have the same appeal. 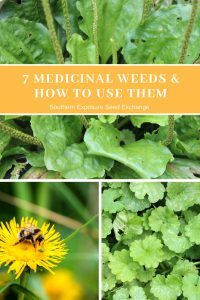 However there are medicinal uses for some of the pesky garden weeds that plague your summer chore list. 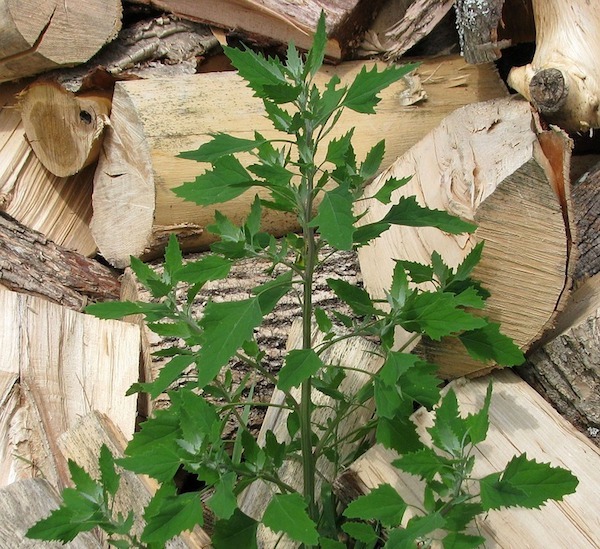 Here’s a list of common medicinal weeds and how they can be used. 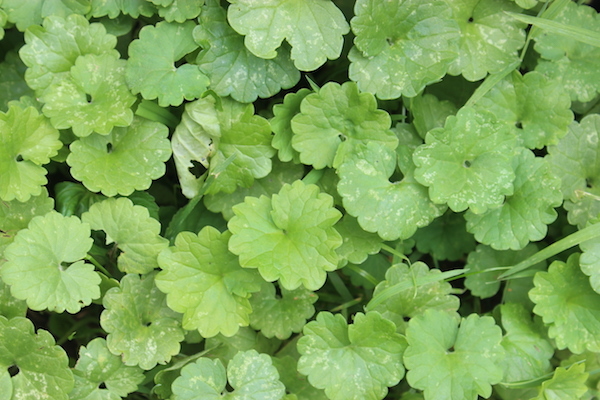 Ground Ivy is edible but not exactly tasty. It has been used medicinally treat a variety of ailments. It’s astringent, anti-inflammatory, and very high in vitamin C. It was once used to treat scurvy. Today you can make it into an immune boosting tea or tincture. 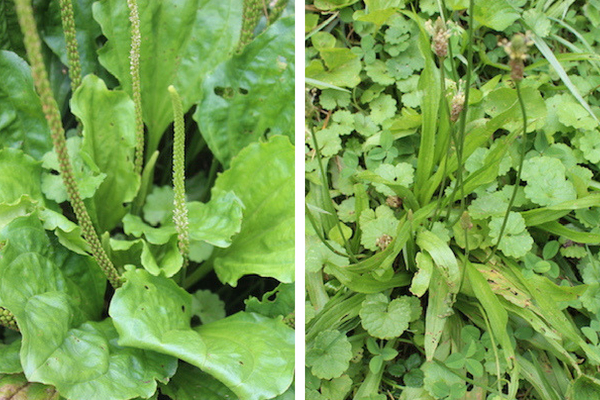 There are two common types of plantain, Plantago major (left) and Plantago lanceolata (right), and both share the same medicinal properties. Plantain leaves and seeds are edible and full of important vitamins but the leaves are most frequently used externally. The leaves have anti-microbial and anti-inflammatory properties and can be crushed and placed on small injuries and insect bites to help soothe and heal. This plant is often used to treat stomach conditions including constipation. It’s also high in vitamin C and can be made into a tincture or eaten fresh. 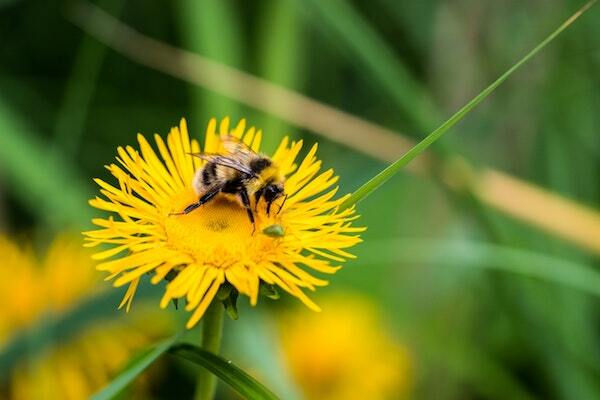 Flowers, leaves, and roots, all parts of the humble dandelion are medicinal. Though it hasn’t been well studied dandelion is believed to help support liver function and balance hormones. 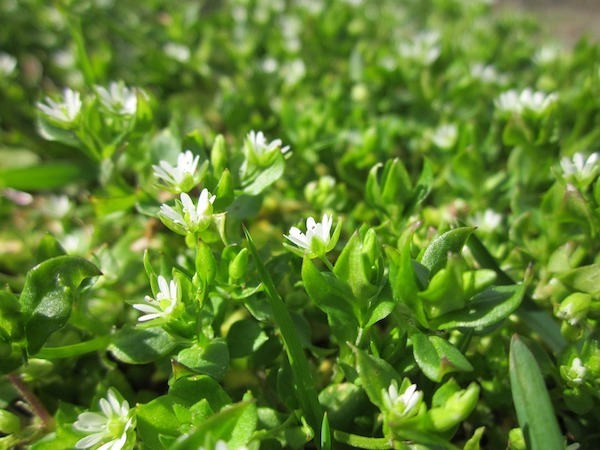 The leaves and flowers can be dried as tea, made into a tincture, or eaten fresh. The roots are sometimes ground and dried as a coffee substitute. Also called goose grass or bedstraw, this plant is most commonly used as an herbal tea to treat urinary infections and promote kidney health. The plant and its seeds are very good at sticking to clothing. 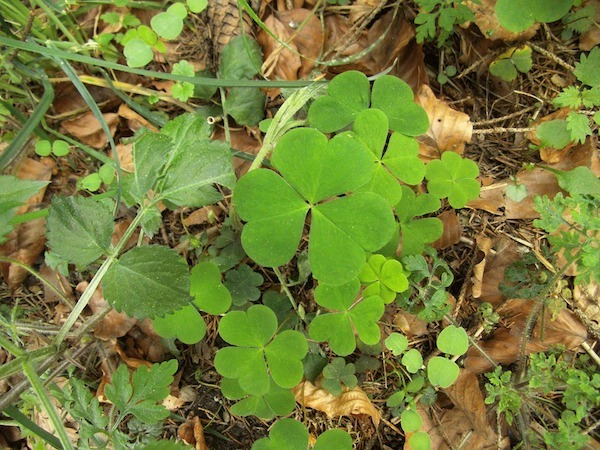 Wood sorrel was once commonly believed to a blood cleanser. It has also been used to treat stomach ailments including vomiting and a poor appetite. Juice from wood sorrel plants is believed to helpful in treating ulcers when used as a mouth rinse. It’s also thought to help treat sore feet when added to a tub of warm water, a perfect use for the busy gardener! Though tasty, it should be consumed in moderation as it is high in oxalic acid which can inhibit calcium absorption. Lambsquarter actually is quite tasty but it can also be used medicinally. Traditionally it was used internally, either eaten fresh, cooked, or made into a tea to treat rheumatic pains and chronic wounds. It’s can also be crushed and used as a poultice to help soothe eczema, sunburns, and insect bites. Using a few herbal remedies won’t eradicate the weeds from your garden or replace your costly health insurance but maybe it will help you connect with nature. 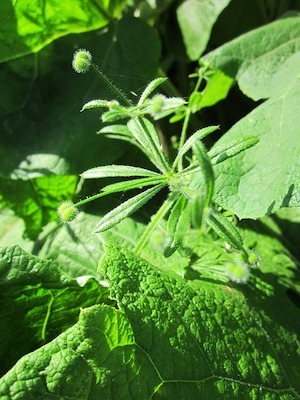 Maybe it will make you a little less sad to see weeds popping up in your garden. What weeds have you utilized from your garden? I’m not a medical practitioner or herbal medicine expert. Please consult a doctor before trying to use herbal remedies to treat any ailment. Some plants may interact with certain prescriptions or pre-existing conditions.